In my previous post, I called out some of the best stand-out features of Apple's iOS 5. But along with those pros, there are also some cons here as well. Most of these have more to do with holes in the operating system, but there are definitely some missed opportunities here. No Multitasking Gestures for iPhone, iPod Touch or iPad 1: It makes sense to give the split keyboard to the iPad only. After all, what would iPhone or iPod Touch users need with it? But gestures are another thing. iPad 2 users get some handy four- and five-finger gestures, but some of those could be implemented in the smaller devices as well. What about letting iPhone users use two or three fingers to swipe between apps? Frankly, hitting that home button twice can get old really fast. As for iPad 1 users who enabled multitasking gestures via Xcode, they'll upgrade to discover that their gestures are gone. Not replaced with iOS 5's gestures, but completely gone. The first Apple tablet proved that it could handle this feature just fine — why bar them from it now? It may seem like such a small thing, but it makes a big difference to anyone who attempts to be productive or multitask with their iOS device on the go. And the fact that this wasn't made obvious to iPad 1 users before they updated is definitely a fail that has upset more than a few iPad 1 users on the webs. No Siri for iPad 2: Presumably, if we believe that only the iPhone 4S has the processing power to deal with Siri (and that's suspect), then it should stand to reason that the iPad 2 should be able to handle it as well, since it also boasts an A5 processor. Sorry, but no dice. For whatever reason — most believe it's due to Apple trying to push sales of the iPhone 4S — the full functionality of Siri's voice control only works on the new handset. Maybe it will be enabled in a future software update, but for now, it's a no-go. No Tabbed Browsing For iPhone/iPod Touch: I can't believe tabbed browsing is for the iPad's Safari only. What a gip. Apps like iCabMobile and Atomic Browser prove that tabbed browsing is not only possible on the iPhone and iPod Touch, but can be very user-friendly and highly useful. iCloud: I know I put this in my top 5 best things post. Well, guess what. It's also one of the worst things about the software too, at least in its current incarnation and especially when it comes to Documents in the Cloud. Fate help you if you edit the same doc in two different places. It can't merge the two, so you'll have to choose which one to go with, thereby potentially losing some crucial changes. Not good. Lack of Design Changes: I said it before, and I'll say it again — the iOS interface is looking really long in the tooth. The static grid of icons might even be a little depressing now, after four years. I'm not saying this needed to rewritten from scratch — and this update did bring some new things to the table — but it would've been good to see some effort made to refresh this interface. While we're on the topic of design changes — what's up with the keyboard? There's an utter lack of refinement to that small cramped virtual QWERTY that's almost inexcusable. (I have tiny fingers, and even I struggle with it.) Of course, Siri and the new text expansion features will help mitigate some of that, but still — it's an extremely neglected area, one that could make all the difference for mobile workers. There are other things I would've loved to have seen here. And it's actually a bit frustrating with iOS 5 that it's so close, but no cigar. For example, big yay to Google Maps having alternate routes now. And Siri's voice features are awesome. So why couldn't they be combined to offer voice-enabled, turn-by-turn directions? Navigation is one area where Android wins out. Speaking of the competition, I long for genuine widgets sitting there on the homescreen. Yes, it's an Android feature, and maybe I'm alone here, but I've always thought the ability to just unlock the phone and immediately see crucial data, without having to hunt around or go through extra steps, is just brilliant. It's something that Android does very well, particularly HTC's Sense. Plus, an iOS-style implementation would also give the UI a much-needed kick in the pants. All that aside, so far the worst thing about iOS 5 is something that isn't even feature-related: It was the torturous upgrade experience for a big proportion of users. If you could even get in, then lucky you — chances are, your day was filled with errors galore and multiple download attempts. I know this was a much-anticipated release, but that was simply painful. What happened to that ginormous server farm, Apple? One thing's for sure — if iOS 6 offers the stuff talked about here, the demand for that will be monstrous. Here's hoping they'll get their ducks in a row by then. Do you agree? Disagree? Go ahead, let me have it in the comments section. While you're there, weigh in: Are there any features that aren't quite thrilling you about iOS 5, or other holes you've spotted? Or are you thrilled with your experience so far? Share your story below. 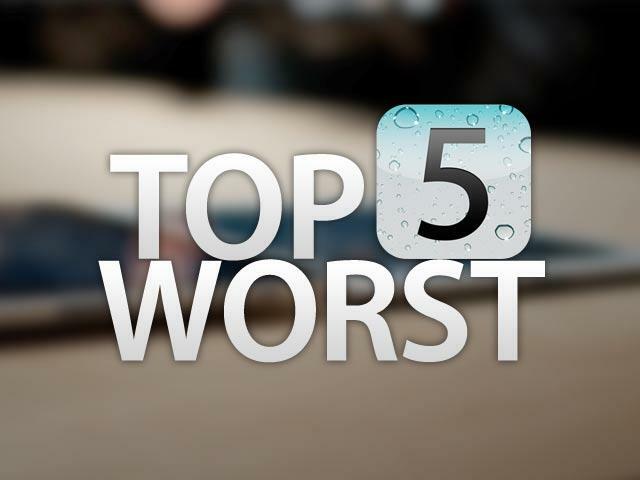 And if you haven't checked out the Top 5 Best Things About iOS 5, you can click here to go there.